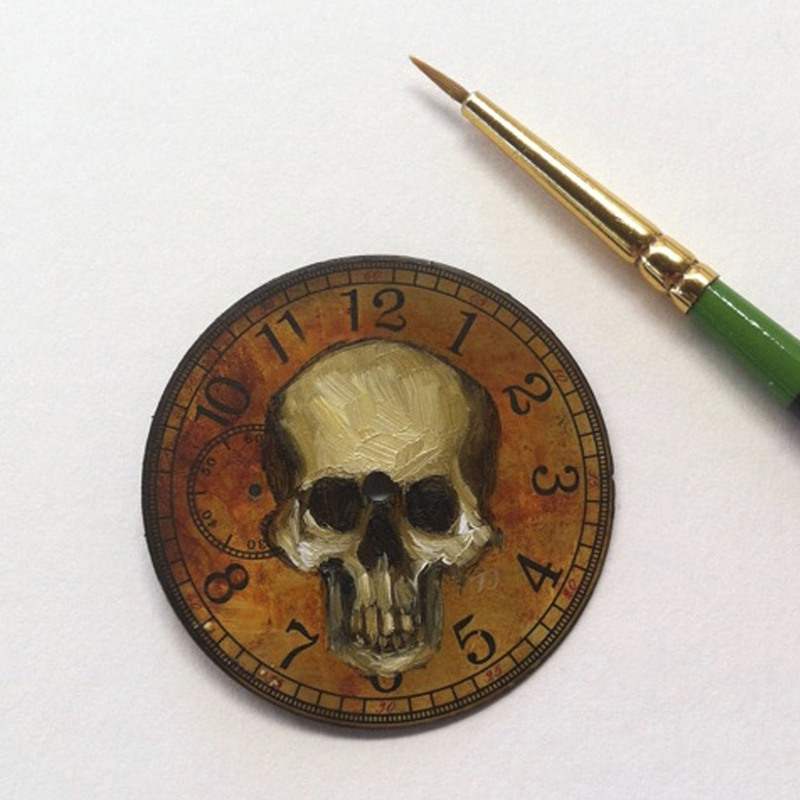 creating these one-of-a-kind hand painted Momento Mori Skull Dials. Australian contemporary visual artist, Timothy John has been exhibiting professionally since 1979. John's work is represented by some of the finest galleries throughout his homeland of Australia and the rest of the world. 'Discovered' by leading Australian art entrepreneur, collector and gallerist, Kym Bonython, in the late 1970's, John has gone on to be a respected member of the Australian art scene, with contributions on a local and national level. 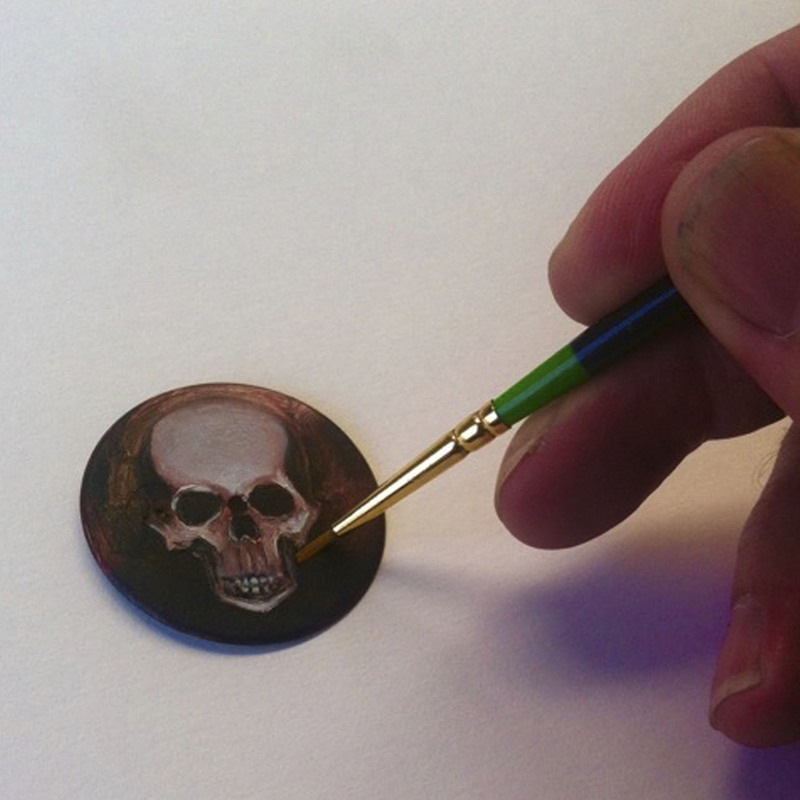 "I admit I am not a miniaturist nor am I interested in creating perfect painstakingly detailed pieces with the use of magnifying lenses (I work in natural light with my normal eyesight), I do greatly admire the work of such artists, those that can paint in minute detail, it really is amazing, however I want my work on watch dials and pens (I also create unique pieces for Montegrappa) to have the passion and the emotion of my work on large canvases. I create my watch dials on either blank metal discs or actual existing watch dials, I hand prepare each disc differently either by sanding back entirely and cleaning (or working within the parameters of an existing dial) over a period of several hours, then depending on the imagery I want to paint, I will lay down several layers of colored oil paint pigments, I do this until I get the desired depth of color and surface texture. These layers need to be thoroughly dry before I proceed to the next stage, I then burnish and sand back with ultra fine wet sand paper. It is a labour intensive process but it is required to give myself the best ‘ground’ to work upon. I then concentrate on the featured painted image for the dial. I use oil pigments, the same that I use in my works on canvas, as I am comfortable with them and their permanence is unquestionable, I use small sable brushes, but I have also been known to use my fingers and other instruments, to get the desired results…it is very similar to how I create my large works on canvas. 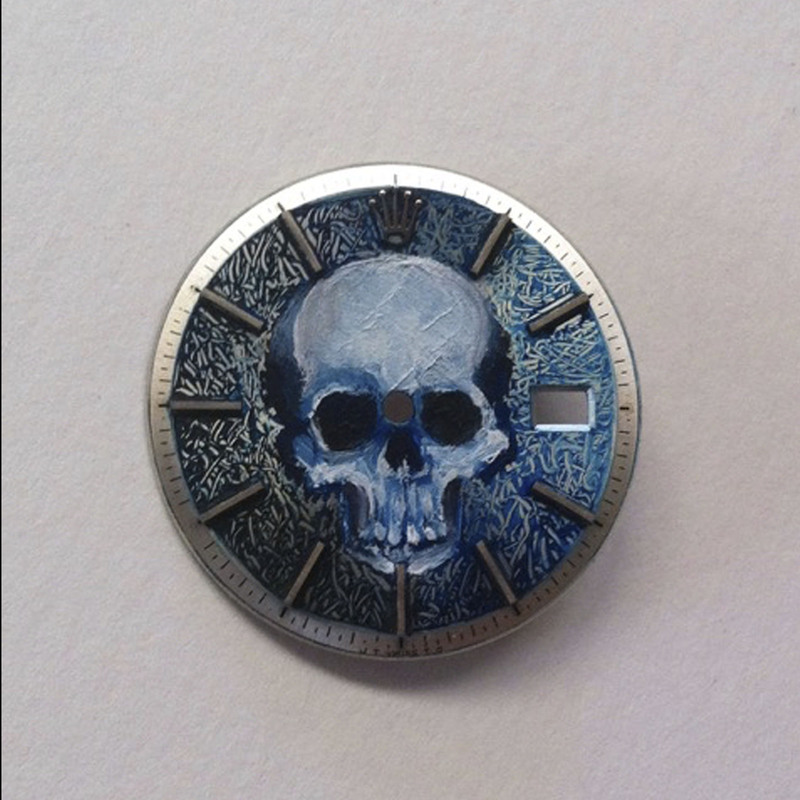 In the case of my skull dials, I under paint the skull structure, slowly building up the image with consecutive layering of oil paint, until I have reached the desired effects I want. Again, each ofthese painted layers needs to be thoroughly dry before I proceed to the next stage. After I have completed the image, I leave it to dry for several days, I then hand burnish the entire dial by gently rubbing it by hand with a soft wooden burnishing tool with glassine paper between the tool and the paint surface and finally with a pure silk cloth, then I leave for a few more days to “settle”, and then I seal the image with either a gloss or matte spray lacquer. The finishing process can take anywhere between 7-14 days, and a completed dial takes approximately 1 month from concept to completion. At the end of the process I want to be able to hold the dial in my hand and feel a sense of beauty while at the same time a preciousness and a strength. WANT DARK TRIUMPH to CREATE a CUSTOM PIECE FOR YOU?